Figure 8 is the fifth studio album by American singer-songwriter Elliott Smith, and the final album he completed before his death. It was recorded from 1998 to 2000 at numerous studios and released on April 18, 2000 through DreamWorks Records. Preceded by the singles "Happiness" and "Son of Sam", Figure 8 was Smith's second release on a major label. Initially titled Place Pigalle, Figure 8 was recorded at Sunset Sound in Hollywood, Sonora Studios in Los Angeles, Capitol Studios in Hollywood and Abbey Road Studios in London. Smith described the songs on the album as "more fragmented and dreamlike". The wall Smith stands in front of in Autumn de Wilde's photograph on the cover of the album exists in Los Angeles, and since his death it has become a memorial to him. It is located at 4334 W. Sunset Boulevard, which is a store by the name of Solutions Audio-Video Repair, just east of the intersection of Sunset Boulevard and Fountain Avenue. It has at some stages been covered with written messages containing lyrics and personal messages to Smith, as well as displaying a stencil of Smith in order to mimic the photo on the album cover. It is regularly graffiti-ed over, followed by regular restorations from fans. The album's first single, "Happiness", was released on February 8, 2000. CMJ New Music Report wrote, "While the tune's production recalls the shimmer of XO, it possesses curiously upbeat energy atypical for Smith". This was followed by the album's second and final single, "Son of Sam", on April 11. A music video was released for "Son of Sam", directed by Autumn de Wilde. Figure 8 was released on April 18. It peaked at number 99 on the Billboard 200. The Japanese release of this album included Smith's cover of The Beatles' song "Because" from the movie American Beauty and "Figure 8", an abridged cover of a Schoolhouse Rock! song. The promotional CD for Figure 8 featured cover artwork by Mike Mills, director of Thumbsucker. Smith contributed songs to the Thumbsucker soundtrack. Figure 8 was well received by critics. NME called it "Smith's best effort to date". Spin wrote, "The record is not a disappointment, it's a progression." The A.V. Club wrote, "Figure 8 is even better [than previous records], a strong collection of lush, densely arranged power-pop [...] and inimitably intimate ballads". AllMusic was more critical, writing, "Even if it is a very impressive statement overall, Figure 8 isn't quite the masterpiece it wants to be". Pitchfork, too, opined, "Figure 8, ultimately, isn't as good a record as XO or Either/Or, though the man's not out of the picture yet." Trouser Press called it "a record that feels very different from its predecessors", describing its style as "brisk and busy, up front and confident, upbeat. While nothing here fails the consistent artistry of his work, neither does any of it make the direct connection to a soul and heart." In 2009, Pitchfork placed Figure 8 at number 190 on its list of the 200 greatest albums of the 2000s, noting, "Not quite as intimate as his earliest records and not quite brash and bombastic like its immediate predecessor, Figure 8 marks a subtle refinement of Smith's songwriting skills" and calling it "one of Smith's most accessible and enjoyable records". Rolling Stone placed it at number 42 on their list of the 100 greatest albums of the decade, calling it Smith's "haunted high-water mark". The album was also included in the book 1001 Albums You Must Hear Before You Die. All tracks written by Elliott Smith. Nugent, Benjamin (2004). Elliott Smith and the Big Nothing. Da Capo Press. ISBN 0-306-81447-1. ^ a b Pareles, Jon (April 27, 2000). "Figure 8". Rolling Stone. Retrieved February 18, 2013. ^ "Sweed Adeline | Figure 8". Sweet Adeline. Retrieved February 18, 2013. ^ Wohlfield, Carsten. "Luna Kafe E-Zine – Elliott Smith: The Hamburger Interview". Luna Kafé. Retrieved February 18, 2013. ^ Fitzmaurice (August 12, 2011). 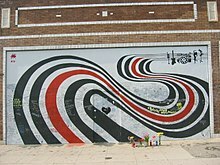 "Elliott Smith Mural Updated for Smith's Birthday | News | Pitchfork". Pitchfork. Retrieved February 18, 2013. ^ Vanderslice, Heidi (February 29, 2008). "Elliott Smith Memorial Vandalized... Again | Music News | Etc | Tiny Mix Tapes". Tiny Mix Tapes. Retrieved June 21, 2013. ^ Jacks, Kelso (February 28, 2000). "Reviews". CMJ New Music Report: 26. Retrieved June 24, 2013. ^ "Elliott Smith". CMJ New Music Report. April 3, 2000. Retrieved June 24, 2013. 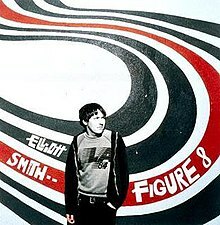 ^ "Elliott Smith •• Figure 8 In Stores April 18th At College Radio Now!". CMJ New Music Report: 2. April 17, 2000. Retrieved June 24, 2013. ^ a b "Elliott Smith – Chart History | Billboard". Billboard. Retrieved June 21, 2013. ^ a b "Reviews for Figure 8 by Elliott Smith". Metacritic. Retrieved February 18, 2013. ^ a b Huey, Steve. "Figure 8 – Elliott Smith". AllMusic. Retrieved February 18, 2013. ^ Browne, David (April 17, 2000). "Figure 8". Entertainment Weekly. Retrieved December 12, 2014. ^ "Elliott Smith: Figure 8 (DreamWorks)". The Guardian. April 14, 2000. Retrieved April 9, 2016. ^ Hilburn, Robert (April 16, 2000). "He Skates Deftly on Thin Ice". Los Angeles Times. Retrieved April 9, 2016. ^ "Elliott Smith: Figure 8". Melody Maker: 48. April 18, 2000. ^ a b Dempster, Sarah (April 14, 2000). "Elliott Smith – Figure 8". NME. Archived from the original on June 1, 2000. Retrieved February 18, 2013. ^ a b Schreiber, Ryan (March 31, 2000). "Elliott Smith: Figure 8". Pitchfork. Retrieved February 18, 2013. ^ O'Brien, Lucy (May 2000). "Elliott Smith: Figure 8". Q (164): 114. Archived from the original on December 4, 2000. Retrieved August 30, 2018. ^ Clover, Joshua (May 2000). "Dream Weaver". Spin. 16 (5): 153–54. Retrieved April 9, 2016. ^ Thompson, Stephen (March 29, 2002). "Elliott Smith: Figure 8". The A.V. Club. Retrieved June 21, 2013. ^ Azerrad, Michael; Robbins, Ira. "Heatmiser". Trouser Press. Retrieved June 21, 2013. ^ "Staff Lists: The Top 200 Albums of the 2000s: 200–151 | Features | Pitchfork". Pitchfork. September 28, 2009. Retrieved February 18, 2013. ^ "100 Best Albums of the 2000s: Elliott Smith, 'Figure 8' | Rolling Stone". Rolling Stone. Retrieved February 18, 2013. ^ "Australian-charts.com – Discography Elliott Smith". Australian-charts.com. Retrieved July 23, 2013. ^ a b "Elliott Smith | Artist | Official Charts". Official Charts. Retrieved July 23, 2013. ^ "British album certifications – Elliott Smith – Figure 8". British Phonographic Industry. Select albums in the Format field. Select Silver in the Certification field. Type Figure 8 in the "Search BPI Awards" field and then press Enter. This page was last edited on 18 February 2019, at 21:10 (UTC).